Soon after dawn, with the tide low, John Young hiked west along the Manatee River, searching in the mangroves. Randy West and Max Dersch hiked east along the river in Robinson Preserve. They too were searching in the mangroves. All three men were looking for stranded sea turtles Jan. 14, the day after West, a ranger with Manatee County’s natural resources department, found a cold-shocked green turtle on the shore in the northwest Bradenton preserve. West had been out on the river trail collecting litter. He said he reached for a piece of plastic, noticed a slight movement on the ground and the green turtle that became known as Robinson was saved. Statewide, thousands of sea turtles were saved during the cold spell, many of them in situations much like Robinson. The Florida Fish and Wildlife Conservation Commission reported that a large-scale team of government employees and wildlife rescue volunteers assisted in the rescue effort, which resulted in more than 750 sea turtles being taken for triage to Merritt Island National Refuge near the Kennedy Space Center and more than 70 turtles on Honeymoon Island near Dunedin. Locally, the team included waterfront homeowners, fishers and representatives from Anna Maria Island Turtle Watch, Manatee County Natural Resources Department and Mote Marine Laboratory. AMITW’s first response was to a call of a stranded turtle on the Island’s north end. AMITW executive director Suzi Fox said the green turtle had perished, probably from cold-shock. AMITW next responded to a call Jan. 11 from a fisherman in Bradenton Beach, who found a green turtle near the bayside on the south end of the Island. 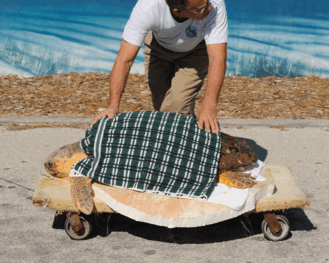 Fox said that turtle, nicknamed Brady, was wrapped in a blanket and taken to Mote Marine in Sarasota, where other turtles suffering cold-shock were being treated, many of them from the east coast. “We’re going into overdrive to care for these animals,” said Mote veterinarian Andy Stamper. Two blasts of Arctic air kept Floridians bundled up and vacationers from frolicking in the water for much of the first 14 days of January. The temperatures — two weeks of nights below 40 degrees in Manatee County — proved more severe for wildlife, with experts reporting the largest fish kill in years, the rescue of several manatees and the massive rescue of sea turtles, which suffer cold shock when water temperatures plummet. The turtles may float listlessly in the water or wash onto shore. After rescuing Brady, AMITW responded to additional calls of turtle strandings, including the rescue of a 150-pound loggerhead in west Bradenton and the green turtle Randy West found on the riverbank in Robinson Preserve. Robinson also was taken to Mote. “I wouldn’t have seen him if I hadn’t reached for the plastic,” said West. So early Jan. 14, just in case there were more like Robinson, West hiked the river’s edge to make sure there were no more stranded turtles in the preserve. Dersch and Young also made the trek that morning, with the temperature about 42 degrees and a sharp wind out of the northeast. They hiked separately, collecting litter as they walked. “If there is anything, we’re going to see it a little bit better at low tide,” Young said. He walked on the tidal flats toward Perico Bayou, a trail he’s familiar with from bird-watching outings. Young saw numerous birds, including herons, osprey, wood storks and vultures, as well as many dead fish, and he collected a bag of litter. But he found no turtles. Neither did the rangers. Young described the trek as doing “due diligence.” He and Fox also scoured the Island beaches for stranded turtles last week. FWC reported more than 3,000 turtles — and the number was still climbing as the Islander went to press — were affected by the cold, most of them green turtles, but also loggerheads, Kemp’s Ridley and hawksbill turtles. Rescuers found stranded turtles in Sarasota, Brevard, St. Lucie, Martin, Indian River, Monroe, Bay, Gulf, Pinellas and Charlotte counties, as well as Manatee.